Ph.D., Indian Statistical Institute, 1982. Research Interests: Stochastic differential equations, Diffusion processes, Reflected processes, Skorokhod problem, Insurance models. Lectures on Insurance Models. Texts and Readings in Mathematics, Vol. 54, Hindustan Book Agency, New Delhi, 2009. (Edited jointly with M.Delampady and T.Krishnan): Probability and Statistics. Universities Press, Hyderabad, 2001. Multidimensional insurance model with risk reducing treaty. Stochas- tic Models. 27 (2011) 363 - 387. Multidimensional insurance models. Bulletin of Kerala Mathematics Association, Special Issue (Guest ed. S.R.S.Varadhan), October 2009, pp. 129 - 141. (Expository): Large deviations: an introduction to 2007 Abel prize. Proc. Indian Acad. Sci. (Math. Sci.) 118 (2008) 161 - 182. A d-person differential game with state space constraints. Applied Mathematics and Optimization 56 (2007) 312 - 342. (Expository): On a Stochastic Model in Insurance. Resonance 11 (2006), no.10, pp. 49 - 68. An insurance network: Nash equilibrium. Insurance: Mathematics and Economics 38 (2006) 374 - 390. (Expository): Brownian Motion. In Current Trends in Mathematics, pp. 76 - 84. Dept. of Mathematics, Madras Christian College, Chennai, 2003. (Expository): Some aspects of Large Deviations. In Informal lecture notes of NBHM sponsored workshop on Partial Differential Equations, Viscosity Solutions and Applications, pp. 100 - 121. Indian Institute of Science, Bangalore, 2003. (Expository): Diffusions and the Martingale problem of Stroock and Varadhan. In Connected at Infinity: a selection of Mathematics by Indians (ed. R.Bhatia), Texts and Readings in Mathematics, Vol. 25, pp. 105 - 129. Hindustan Book Agency, New Delhi, 2003. (Jointly with Amites Dasgupta): Transition density of a re ected symmetric stable Levy process in an orthant. In Probability, Statistics and their Applications: Papers in honor of Rabi Bhattacharya (ed. K.B.Athreya, M.Majumdar, M.Puri and E.Waymire), IMS Lecture Notes - Monograph series, Vol. 41, pp. 117 - 131. Institute of Mathematical Statistics, Beachwood, Ohio, 2003. (Jointly with Amites Dasgupta): On refleected symmetric stable Levy processes. In Advances in Stochastic Modelling (ed. J.R.Artelejo and A.Krishnamoorthy) pp. 23 - 27. Notable Publications Inc., New Jersey, 2002. On reflected backward stochastic differential equations. Calcutta Statistical Association Bulletin 52 (2002), Special 4th Triennial Proceedings Volume (ed. Arijit Chaudhuri and Malay Ghosh) pp. 251 - 260. Reflected backward stochastic differential equations in an orthant. Proc. Indian Acad. Sci. (Math. Sci.) 112 (2002) 347 - 360. A Skorokhod problem with generalized time and space dependencies. In Advances in Probability and Stochastic Processes (ed. A.Krishnamoorthy, N.Raju and V.Ramaswami) pp. 157 - 166. Notable Publications Inc., New Jersey, 2001. Reflecting Brownian motion in a Lipschitz domain and a conditional gauge theorem. Sankhya Ser.A 63 (2001) 178 - 193. A Subsidy - Surplus Model and the Skorokhod problem in an Orthant. Mathematics of Operations Research 25 (2000) 509 - 538. (Expository): On the Stroock-Varadhan theory of diffusions. Current Science 78 (2000) 1155 - 1156. (Jointly with S.Balaji): Passage time moments for multidimensional diffusions. Journal of Applied Probability 37 (2000) 246 - 251. (Jointly with S.Balaji): Asymptotics of reflecting diffusions in an orthant. In Proc. International Conference on Stochastic processes, Cochin, Dec.1996, (ed. A.Krishnamoorthy) pp. 57 - 81. Dept. of Mathematics, Cochin University of Science and Technology, Cochin, 1998. (Expository): (Jointly with S.Balaji): Reflecting diffusions in an orthant: an introduction. Differential Equations and Dynamical Systems 6 (1998) 25 - 36. (Jointly with S.Balaji): Reflecting diffusions in the quadrant: recurrence and transience. Differential Equations and Dynamical Systems 6 (1998) 9 - 24. (Jointly with S.Balaji): Recurrence and transience of diffusions in a half space. Bernoulli 3 (1997) 97 - 119. (Expository): The normal distribution I, II. Resonance 2 (1997), no.6, pp. 15 - 24; no.7, pp. 27 - 37. Transition densities of reflecting diffusions. Sankhya Ser.A 58 (1996) 347 - 381. (Expository): Reflecting Diffusions. Current Science 69 (1995) 231 - 236. (Jointly with S.Balaji): Reflecting Brownian motion in a quadrant: a survey. In Proc. Third Ramanujan Symposium on Stochastic Processes and their applications, Univ. of Madras, Jan. 1994, pp. 59 - 70. New Age International Ltd., New Delhi, 1995. On the gauge for the Neumann problem in the half space. Sankhya Ser.A 56 (1994) 379 - 384. (Jointly with G.Kallianpur, J.Xiong and G.Hardy): The existence and uniqueness of solutions of nuclear space valued stochastic differential equations driven by Poisson random measures. Stochastics and Stochastics Reports 50 (1994) 85 - 122. Stochastic solutions of differential equations. In Proc. Mahalanobis Birth Centenary Symposium on Probability and Statistics, Kerala 1993, pp. 7 - 28. On the gauge for the third boundary value problem. In Stochastic Processes: a festschrift in honour of Gopinath Kallianpur (edited by S.Cambanis, J.K.Ghosh, R.L.Karandikar and P.K.Sen) pp. 285 - 289. Springer, New York, 1993. Diffusions and the Neumann problem in the half space. Sankhya Ser.A 54 (1992) 351 - 378. Hitting of submanifolds by diffusions. Probability Theory and Related Fields 78 (1988) 149 - 163; addendum, ibid 84 (1990) 279. (Jointly with R.N.Bhattacharya): On the central limit theorem for diffusions with almost periodic coeffients. Sankhya Ser.A 50 (1988) 9 - 25. Hitting a boundary point by diffusions in the closed half space. Journal of Multivariate Analysis 20 (1986) 143 - 154. A characterization of the normal distribution. Sankhya Ser.A 47 (1985) 410 - 414. Recurrence of projections of diffusions. Sankhya Ser.A 45 (1983) 20 - 31. (Jointly with R.N.Bhattacharya): Recurrence and ergodicity of diffusions. Journal of Multivariate Analysis 12 (1982) 95 - 122. An elementary proof of Girsanov's formula. Sankhya Ser.A 41 (1979) 263 - 270.
Review of Point Process Theory and Applications: Marked Point and Piecewise Deterministic Processes by Martin Jacobsen. Sankhya 68 (2006) 359 - 360.
Review of Markov Processes from K .Ito's Perspective by Daniel W. Stroock. Sankhya 67 (2005) 133 - 136.
Review of A Concise Introduction to the Theory of Integration by Daniel W.Stroock. Current Science 78 (2000) 744. Large deviations: introductory notes. Enlarged version of a series of lectures given at a Summer School on Probability and Applications held at Kerala School of Mathematics, Kozhikode during May - June 2010. Poisson process and insurance: an introduction. Prepared for a series of lectures given at a Refresher course in Applied Stochastic Processes sponsored by the Indian Academy of Sciences, Bangalore, held at the Indian Statistical Institute, New Delhi in Dec. 2005. Stochastic differential equations with constant dispersion. Prepared for a series of lectures given at a Refresher course in Probability, Stochas- tic Processes and Applications sponsored by the Indian Academy of Sciences, Bangalore, held at the Dept. of Mathematics, Cochin University of Science and Technology, Kochi in Sept. - Oct., 2005. Some connections between S.D.E. 's and P.D.E. 's: an exposition. Prepared for a lecture given at a Discussion Meeting on Stochastic Differential Equations sponsored by the Indian Academy of Sciences, Bangalore and the Indian Statistical Institute in June 1991. Elected a Fellow of the Indian Academy of Sciences, Bangalore with effect from January 2002. Serving on the editorial board of Sankhya since October 1999. Served on the editorial board of Resonance during January 2003 to December 2007. 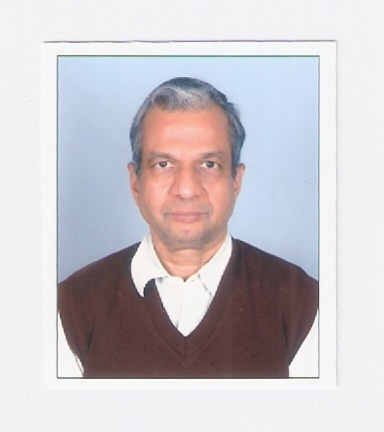 Served as a member of the Science Education Panel of the Indian Academy of Sciences, Bangalore, during 2004 - 2006. Delivered Prof. Wazir Hasan Abdi Memorial Lecture at the Department of Mathematics, Cochin University of Science and Technology, Kochi in October 2005. Delivered Prof. M.N.Gopalan Endowment Lecture at the 22nd Annual Conference of Ramanujan Mathematical Society held at National Institute of Technology, Surathkal, Karnataka in June 2007. Delivered Prof. B.G.Raghavendra Memorial Lecture at the Department of Statistics, University of Mysore in April 2009.